For the past couple of months, I've been uncharacteristically "meh" about wedding planning. I've looked at blogs here and there, pinned a few things, but haven't really checked much off my "to-do" list. This isn't a huge problem because we got so much done very early on, but I know if I don't keep on top of all the DIY projects, all of a sudden it's going to be two months before the wedding and I'll have nothing done. This is what I've been reminded of many times by many former brides-to-be. So over the weekend I decided to get things in order and complete a couple easy wedding decor projects. I had all the materials at home already and plenty of Olympics to watch while I worked, so there was no excuse to put anything off any further. 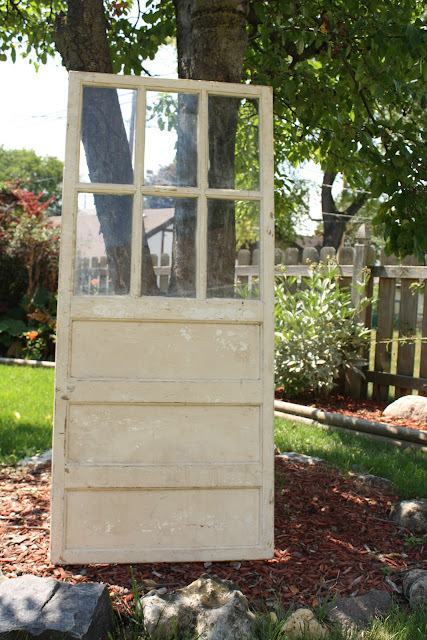 Right after we bought our home last year, we made a trip to the Habitat for Humanity ReStore to see if we could find anything of interest to add to the decor. Almost instantly I was drawn to this little beaten-up door with glass panels. I wasn't sure what I wanted to do with it, but for $2 I knew I'd put it to use somehow. Eric is totally against my "I'll find some way to use it!" mind frame (or, as he refers to it, my "hoarding tendencies"), so he was getting antsy having this thing collect dust in our house without being used. But there it sat, for well over a year in our upstairs bedroom, barely getting glanced at, much less "put to use." Sensing Eric's frustration with the door just taking up space, I had the idea months ago to incorporate the door into our wedding decor by turning the glass panels into little chalkboards. 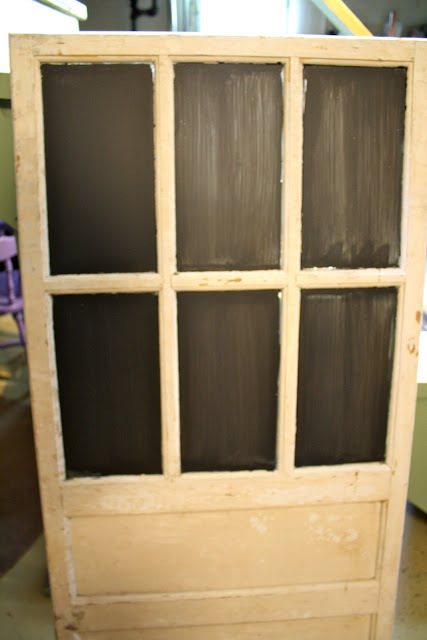 While I won't share exactly how it will be used, I will show you how I transformed the door into a chalkboard. I started by taping off the panels to prepare it for painting... Side note: Is there anything more tedious than taping off little intricate panels? The taping process took twice as long as the actual painting did. 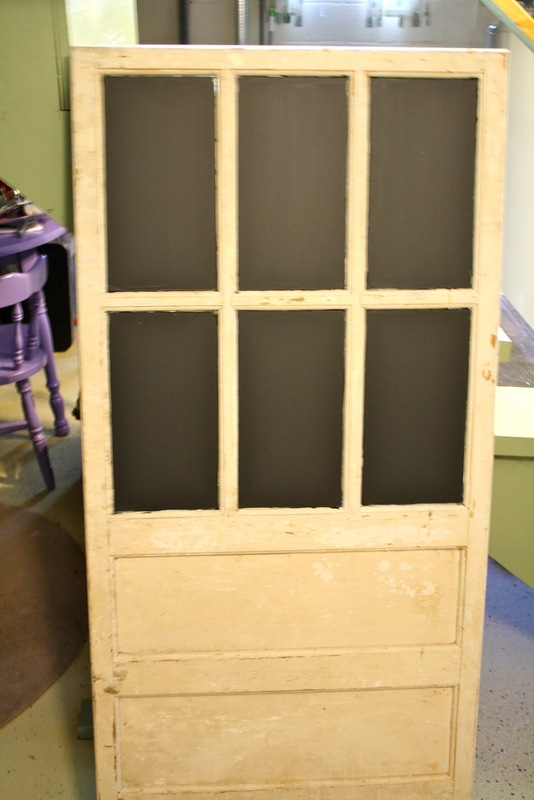 I painted two coats with chalkboard paint purchased at Home Depot for a previous project and let the paint cure overnight. The next morning, I went down to the basement to remove the tape and was horrified when I stood the door upright and realized the two coats were completely transparent in the light. Ugh. I already mentioned how much I hate taping around panels, so I definitely didn't want to have to tape off the back of door to paint that side, as well. So I racked my lazy brain to think of a way to get out of taping again. What my lazy brain came up with was backing the glass panels with black cardstock! 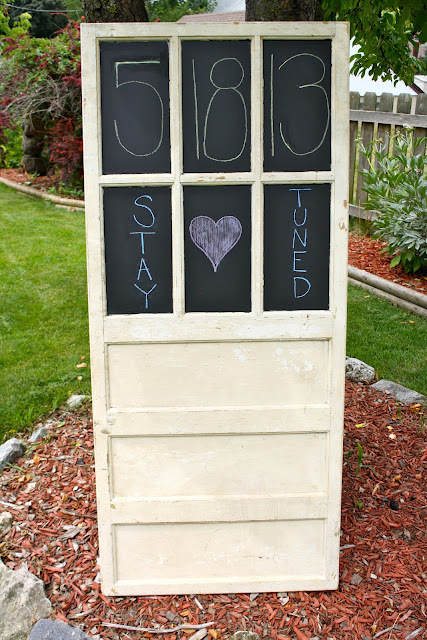 The door will be propped up against a wall, so the back won't be visible to people at the wedding. Because no one will be able to see my little shortcut, I was perfectly fine with backing the panels with cardstock rather than more chalkboard paint for a more opaque look. I measured the panels and cut six rectangles to size, then affixed to the glass with double-sided tape. I'm really excited thinking about the final product once this chalkboard door is put to use in the wedding. And I'm hoping I can find a way to use it around the house after the wedding is over, too! Gimme your two cents or your whole dollar's worth. I wanna know your thoughts!